Taking Snake from rookie to superhero. In Why I Love, PC Gamer writers pick an aspect of PC gaming that they love and write about why it's brilliant. Today, Sam reaches MAXIMUM POWER in MGS5. 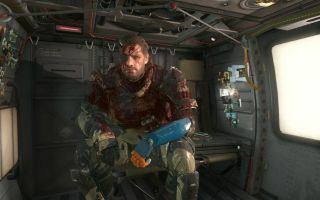 I played Metal Gear Solid 5: The Phantom Pain for about 30 hours in order to write my review. Over a year later, I've managed to put in another 60 hours on top of that, some of which had a purpose, but a lot of which could also be categorised as dicking around. Long after I'd cleared the final mission, 'The Truth', which I think everyone hated except me, I found myself going back to the occupied sprawls of Afghanistan and the Angola-Zaire border to perform hit-and-runs alongside my fictional dog, or to clear out outposts in record time by arcing grenades from atop hills and cliffs. Before I knew it, I'd played MGS 5 even more than GTA 5, and had long forgotten what Snake was even doing in Afghanistan. Something about deleting language and skeleton men? I dunno. Someone wore a bikini, it made no sense. MGS 5 has a near endless nature to it that I love. While playing through the story lets players get to grips with the majority of basic weapons and upgrades available to Snake, the coolest toys are deliberately put out of reach within the game's vast upgrade trees, or gated behind objectives in specific side ops. This progression system gradually empowers the player like a great RPG does, expanding from a limited suite of useful weapons to a vast armoury of explosives, firearms and novelty costumes for Snake and his allies. As a result, it's simply not the same game after 90 hours as it is after five or ten. Your understanding of how MGS 5's stealth and combat systems grows as your arsenal does. For the Ground Zeroes prologue and the first few missions of The Phantom Pain, I remember everything feeling a little overwhelming as I learned how navigating the world worked, and how the AI behaved. The game slowly builds up your confidence by letting you experiment with more and more toys to find your ideal loadout. By my 90th hour with the game, I carry a robot hand—the Hand of Jehuty, from Hideo Kojima's own cult mech PS2 series, Zone of the Enders—that can drag a pursuing soldier from 20 feet away to Snake in a daze, so I can immediately knock them out. I own a Parasite Suit, which emulates the supernatural abilities of the game's irritating skull soldiers. My fulton recovery system, which once yanked soldiers into the sky for extraction, now opens a portal through time and space to deliver a goat back to my base. At this point, my Snake is basically a superhero. Not just because of these novel upgrades, but because the game essentially requires you to teach yourself how to use them effectively. The journey to unlocking all of this has been a slow burn, but also exciting. With no narrative thread to follow anymore, every side op is an opportunity for experimentation. I play The Phantom Pain like I play GTA—that attitude of, let's take all of these toys out for a spin and see what sort of trouble I can cause. You couldn't really play the previous Metal Gears in the same way, since the levels were narrow and linear by design. Few sandbox games are constructed to be played from as many angles as this, and I'd personally argue that none are as precise to control or as customisable. Metal Gear Solid 5 is designed to be living and endless. It's a truly generous single-player game that still challenges you to experiment with your strategies, and I think its best moments come well after the credits.